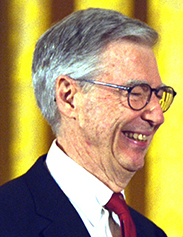 Fred McFeely Rogers (20 Mairch 1928 – 27 Februar 2003) wis an American televeesion personality, muisicker, puppeteer, writer, producer, an Presbyterian meenister. He wis kent as the creautor, componer, producer, heid writer, an host o the preschuil televeesion series Mister Rogers' Neighborhood frae 1968 till his reteerment in 2001. Rogers wisna happy wi the televeesion shaws that childer war seein. He begoud tae write an perform local Pittsburgh-aurie shaws for childer. In 1968, Eastern Educational Television Network begoud naitionwide distribution o Rogers's new show on WQED. For thirty years, Rogers becam a televeesion icon o childer's enterteenment an eddication. Rogers wis born in Latrobe, Pennsylvania tae James Rogers an Nancy McFeely. His faither wis a businessman. His mither came frae a rich Pittsburgh faimily an an aw wis a hospital volunteer durin an efter World War II. His grandfather frae his mither's side, Fred McFeely, wis the preses o McFeely Brick, ane o Latrobe’s lairgest businesses. Rogers grew up in a lairge brick mansion at 737 Weldon Street in Latrobe. While studyin at Rollins College, Rogers met Sara Joanne Byrd who wis frae Oakland, Florida. Thay war marrit on Juin 9, 1952. Thay haed tae sons: James, in 1959, an John, in 1961. Rogers enterit seminary efter college but wantit tae work wi televeesion. In an interview wi CNN, Rogers said, "I went into televeesion because I hatit it so, an I thought there's some way of usin this fabulous instrument to nurture those who would watch an listen". He applit for a job at NBC in New York Ceety in 1951 an workit first as an assistant producer, an later as a network floor director on muisical programs sic as Your Hit Parade, The Kate Smith Hour, an The Voice o Firestone. He an aw workit on Gabby Hayes's childer's show. Mister Rogers' Neighborhood began in 1968 an ran for 895 episodes. It airit on National Educational Television, which later became The Public Broadcasting Service. The last set o new episodes wis tapit in Decembar 2000 an began airin in August 2001. Bi 1985, aicht percent o fowk livin in the Unitit States watchit the show. The program ayeweys startit with Rogers coming home, singin his theme sang "Won't You Be My Neighbor? ", an changin intae sneakers. In his show, Rogers wad ayeweys gang on trips, teach new things an show short films on "Picture, Picture". Each episode includit a trip tae Rogers's "Neighborhood of Make-Believe" wi a trolley, a castle, an the kinrick's ceetizens, includin Keeng Friday XIII. Rogers ayeweys fed his aquarium fish durin episodes an wad ayeweys say this tae his audience he wis feedin them acause he receivit a letter frae a youn blind girl who wantit tae know each time he did this. The program wad end wi Rogers wingin "It's Such a Good Feelin". Rogers believit nae tae act differently when he wis bein filmit an how he acted normally, sayin that "One of the greatest gifts you can give anybody is the gift o your honest self. I also believe that kids can spot a phony a mile away". Rogers wrote awmaist aw o the muisic on the program. He wantit tae teach childer tae luve themselves an others, an he talkit aboot common childhood fears wi comfortin sangs. He ance teuk a trip tae a childer's hospital tae show childer that a hospital is nae a place tae fear. Rogers wad talk aboot social issues on his program includin the assassination of Robert F. Kennedy, racism an divorce. Ane famous episode, Rogers soakit his feet wi Officer Clemmons (François Clemmons), who wis African-Americain, in a kiddie pool on a het day. The scene wis a message o inclusion durin a time when racial segregation in the Unitit States wis common. Rogers wis an aw kent for havin childer wi disabilities on his show. In a 1981 episode, Rogers met a young quadriplegic boy, Jeff Erlanger, who showit how his electric wheelchair workit an explainit why he needed it. Erlanger an Rogers baith sang a duet o the sang "It's You I Like". Afore the tapin, Erlanger haed lang been a fan o the program, an his parents wrote a letter tae Rogers askin if thay coud meet. Rogers never talkit aboot his religious beliefs on the show acause he did nae want ony viewer tae feel ignored frae the show. Durin the Gulf War, he comfortit his audience that aw childer in the neighborhood wad be well carit for an askit parents tae promise tae tak care of thair childer. Efter the September 11 terrorist attacks, Rogers tapit public service announcements for parents aboot how tae discuss tragic world news events wi thair childer, tellin them tae "look for the helpers". The quote continues tae gang viral followin tragic news events. In 1969, Rogers appearit afore the Unitit States Senate Subcommittee on Communications. His goal wis tae ask the Senate tae support fundin for PBS an the Corporation for Public Broadcasting, acause proposit budget cuts. In aboot sax minutes o testimony, Rogers spoke o the need for social an emotional eddication that public television gae. He arguit that ither televeesion programmin lik his Neighborhood helpit encourage childer tae acome happy ceetizens. The chairman o the subcommittee, John O. Pastore, did nae know Rogers or his work an wis whiles said tae be impatient. Houiver, efter Rogers, Pastore said that the testimony haed gien him goosebumps, an said, "I think it's wonderful. Looks like you just earnit the $20 million". The subsequent congressional appropriation, for 1971, increasit PBS fundin frae $9 million tae $22 million. In 1978, while takin a break frae tapin new Neighborhood episodes, Rogers hostit an interview program for adults on PBS callit Old Friends...New Friends. The anly time Rogers appearit on televeesion as someone ither than himself wis in 1996 when he playit a preacher on ane episode o Dr. Quinn, Medicine Woman. Rogers voicit himself on the "Arthur Meets Mister Rogers" episode o the PBS Kids series Arthur. Rogers haed an apartment in New York Ceety an a simmer home on Nantucket Island in Massachusetts. Rogers wis reid–green color blind, swam every mornin, an neither smoked nor drank. He wis a vegetarian on acause he believit it wis wrong, sayin "I don't want to eat anythin that has a mother". Despite popular rumors, he never servit in the military as a Navy SEAL durin the Vietnam War an never haed tattoos. In 1992, he wis awardit the Peabody Award. Rogers wis diagnosit wi stomach cancer in December 2002, nae lang efter his retirement. He haed surgery on Januar 6, 2003, which wis unsuccessful. A week earlier, he wis grand marshal o the Tournament o Roses Parade, wi Art Linkletter an Bill Cosby. Rogers died on the mornin o Februar 27, 2003 efter slippin intae a coma, at his home in Pittsburgh wi his wife bi his side, less nor a month afore he wad hae turnit 75. Mair than 2,700 fowk went tae his memorial service at Heinz Hall, includin umwhile Good Morning America host David Hartman, Teresa Heinz Kerry, philanthropist Elsie Hillman, PBS Preses Pat Mitchell, Arthur creautor Marc Brown, an The Very Hungry Caterpillar author-illustrator Eric Carle. Rogers is burit at Unity Cemetery in Latrobe. Rogers wis honorit wi the Presidential Medal o Freedom bi Preses George W. Bush, forty honorary degrees, an a Peabody Award. He wis addit intae the Televeesion Hall o Fame. He wis listit nummer 35 o the TV Guide's Fifty Greatest TV Stars o All Time. The Smithsonian Institution haes ane of his sweaters as a "Treasure o Americain History". ↑ 3.0 3.1 "Early Life". Fred Rogers Center for Early Learning & Children's Media. Retrieved 2018-10-30. ↑ 4.0 4.1 King, M. (2018). The Good Neighbor: The Life and Work of Fred Rogers. ABRAMS. ISBN 978-1-68335-349-2. Retrieved 2018-10-30. ↑ "It's a Sad Day in This Neighborhood". latimes. 2003-02-28. Retrieved 2018-10-30. ↑ Vancheri, Barbara (December 25, 2003). "As promised, Joanne Rogers is doing 'fine'". Pittsburgh Post-Gazette. Archived frae the oreeginal on December 22, 2017. Retrieved December 22, 2017. ↑ "Fred McFeely Rogers". UXL Newsmakers (2005). 2005. Archived frae the oreeginal on September 24, 2008. Retrieved December 13, 2007 – via Find Articles. ↑ 10.0 10.1 Junod, Tom (November 1998). "Can You Say ... 'Hero'?". Esquire. Archived frae the oreeginal on March 1, 2003. Retrieved July 30, 2010. ↑ Millman, Joyce (August 10, 1999). "Salon Brilliant Careers: Fred Rogers". Salon. Archived frae the oreeginal on December 18, 2010. Retrieved July 30, 2010. ↑ "In the Land of Make Believe, The Real Mister Rogers". Washington Post. 1982-11-18. Retrieved 2018-10-20. ↑ "Fred Rogers". Television Academy Interviews. 2018-01-01. Retrieved 2018-10-31. ↑ Rogers, F. (1996). Dear Mr. Rogers, Does It Ever Rain in Your Neighborhood? : Letters to Mr. Rogers. Penguin Publishing Group. ISBN 978-1-101-16169-2. Retrieved 2018-10-30. ↑ 27.0 27.1 "The Music of Mister Rogers". Pittsburgh Gazette. February 22, 2018. Retrieved November 2, 2018. ↑ 30.0 30.1 Blickley, Leigh (2018-06-08). "The Gay 'Ghetto Boy' Who Bonded With Mister Rogers And Changed The Neighborhood". HuffPost. Retrieved 2018-10-28. ↑ 31.0 31.1 "How 'Mister Rogers' Neighborhood' Championed Children With Disabilities". Guideposts. 2018-10-15. Retrieved 2018-10-30. ↑ 32.0 32.1 "Obituary: Jeffrey Erlanger / Quadriplegic who endeared himself to Mister Rogers". Pittsburgh Gazette. June 14, 2007. Retrieved November 1, 2018. ↑ "Remembering Mr. Rogers, a True-Life 'Helper' When the World Still Needs One". EW.com (in Inglis). Retrieved 2018-03-08. ↑ "PBS Public Service Announcement with mister rogers : NeighborhoodVideo : Free Download, Borrow, and Streaming : Internet Archive". Internet Archive. 2017-10-17. Retrieved 2018-10-26. ↑ "Mr. Rogers' words of comfort revived in wake of tragedy". Pittsburgh Post-Gazette. 2012-12-18. Retrieved 2018-10-28. ↑ 38.0 38.1 38.2 38.3 38.4 38.5 "Mister Rogers defending PBS to the US Senate". June 29, 2007. Retrieved September 1, 2016 – via YouTube. ↑ 39.0 39.1 "Fred Rogers Beyond the Neighborhood: Senate Committee Hearing". Fred Rogers Center. 1969. Archived frae the oreeginal on June 17, 2012. Retrieved May 27, 2014. ↑ "Fred Rogers Moves into a New Neighborhood—and So Does His Rebellious Son". PEOPLE.com. 1978-05-15. Retrieved 2018-10-26. ↑ Millman, Joyce (August 10, 1999). "Salon Brilliant Careers: Fred Rogers". Salon.com. Salon Media Group. Retrieved July 30, 2010. ↑ Lewis, Daniel (February 28, 2003). Fred Rogers, Host of 'Mister Rogers' Neighborhood,' Dies at 74, The New York Times. Retrieved on January 9, 2011. ↑ "The Two Freds: When Phelps Protested Mr. Rogers's Memorial". The New Yorker. March 20, 2014. Retrieved November 2, 2018. ↑ "Pittsburgh Bids Farewell to Fred Rogers with Moving Public Tribute". May 4, 2003. Retrieved November 2, 2018. ↑ "Hall of Fame". Academy of Television Arts & Sciences. Archived frae the oreeginal on December 16, 2008. Retrieved December 3, 2008. This page wis last eeditit on 24 Februar 2019, at 02:10.